A urological device (800, 810, 830, 850, 860, 870, 900, 910, 920) comprises a urological valve (802, 803, 812, 861, 901), for location in the bladder of a patient and a valve support stem (801, 813, 863, 902), for location in the urethra of a patient. The valve has a normally closed configuration to prevent flow from the bladder and an open configuration for fluid flow through the valve. The valve is automatically movable from the closed configuration to the open configuration in response to a pre -set hydrodynamic pressure applied for a pre-set time. In one case the valve has a plurality of valve leaflets with a region of co-aption between the valve leaflets. In the normally closed configuration the valve leaflets are engaged at the region of co-aption and in the open configuration the leaflets are separated at the co-aption region for fluid flow through the valve. The main cause of stress urinary incontinence (SUI) in males is radical prostatectomy for cancer. Catalona WJ, Carvalhal GF, Mager DE, Smith DS. Potency, continence and complication rates in 1 ,870 consecutive radical retropubic prostatectomies. J Urol. 1999 Aug; 162(2):433-8 report that the incidence of SUI 1 yr post radical prostatectomy is 20%. Lee WR, Schultheiss TE, Hanlon AL, Hanks GE. Urinary incontinence following external-beam radiotherapy for clinically localized prostate cancer Urology. 1996 Jul;48(l ):95-9 report that adjuvant radiotherapy of prostate cancer can also affect treatment of SUI. According to the invention there is provided a urological device comprising a urological valve for location in the bladder of a patient and a valve support stem for location in the urethra of a patient. The valve has a normally closed configuration to prevent flow from the bladder and an open configuration for fluid flow through the valve. The valve is automatically movable from the closed configuration to the open configuration in response to a pre-set hydrodynamic pressure applied for a pre-set time. In one embodiment the valve support stem comprises a generally tubular support for extending at least partially through the urethra, the valve being located at one end of the support. In one case the device comprises a bladder retainer for locating the valve in the bladder. The bladder retainer may comprise a flare extending radially outwardly of the support stem. The bladder retainer may be of the same material as that of the support. In one embodiment the bladder retainer, the support and the valve are integrally moulded. The device may comprise stiffening means for the bladder retainer. The bladder retainer stiffening means may be of a shape memory material such as Nitinol. In one embodiment the device comprises a urethral retainer to prevent migration of the device. In one case the urethral retainer comprises a meatal tab. In one embodiment the urethral retainer comprises a bulbous region of compressive material. The valve may be adapted to open in response to a preset pressure applied over a preset time. The valve may be adapted to open in response a pressure of at least 750mm H20 applied for at least 5 seconds. In one embodiment the valve is adapted to remain closed in response to a spike pressure applied for a short time as would be generated by a user coughing. The spike pressure may be 900mm H20 applied for a period of less than 0.5 seconds. In one embodiment the valve remains open as fluid flows therethrough without a requirement for a user to apply urological pressure. The valve may return to the closed configuration when flow through the valve has substantially stopped. In One embodiment the valve comprises at least three valve leaflets. There may for example be six valve leaflets. The valve may comprise a main body having a region which defines a hinge about which portion of the valve main body is movable between the closed and open configurations. In one embodiment the urological device comprises a support for the valve. The support may be generally cylindrical. In one case the support is of the same material as that of the valve. In one embodiment the valve and support are integrally moulded. The urological device may comprise a first retainer for locating the device in the bladder. The first retainer may comprise a flare extending radially outwardly of the support. The first retainer may be of the same material as that of the support. The urological device may comprise stiffening means for the first retainer. The retainer stiffening means may be of a shape memory material such as Nitinol. In one embodiment the urological device comprises a second retainer to prevent proximal migration of the device. The second retainer may comprise a meatal tab. The second retainer may comprise a bulbous region of compressive material. In one embodiment the urological device comprises an antimicrobial coating. The invention also provides a drainage catheter system comprising a valve, the valve having:- a normally closed configuration in which the valve is closed; and an open configuration in which the valve is opened for flow through the valve; the valve being automatically movable from the closed to the open configuration for flushing of the catheter. The valve may be a. one-way valve. The valve may be movable from the closed to the open position in response to a predefined yield pressure. The valve may be of a biocompatible viscoelastic foam material. In one case the catheter comprises a urological catheter. According to the invention there is provided a urological device comprising a urological valve having:- a normally closed configuration in which the valve is closed; and an open configuration in which the valve. is opened for flow through the valve; the valve being movable from the closed to the open configuration in response to applied urological pressure. In one aspect the valve everts on movement between the closed and the open configuration in response to applied urological pressure. On reduction of urological pressure to a preset pressure the valve returns from the open to the closed configuration. In another aspect the device comprises a housing for the valve, the housing having an inlet on one side of the valve and an outlet on the opposite side of the valve. The inlet may be adapted for mounting to a catheter such as a Foley catheter. The outlet may be adapted for mounting to a drainage bag. In one embodiment the device comprises a collar to support the valve in the housing. The valve may comprise a valve body and the collar is arranged to engage the valve body to control the pressure at which the valve moves from the open to the closed configuration and/or from the closed to the open configuration. In one embodiment the valve is adapted to open in response to a preset pressure applied over a preset time. The valve may be adapted to remain closed in response to a spike pressure applied for a short time such as would be generated by a user coughing. The invention also provides a drainage catheter system comprising a valve, the valve having:- a normally closed configuration in which the valve is closed; and an open configuration in which the valve is opened for flow through the valve; the valve being automatically movable from the closed to the open configuration for flushing of the catheter. The valve may comprise a valve body of polymeric material. The valve may comprise an outer support region. The valve may also have a main body region extending between the support region and the valve leaflets. In one case the main body region is generally concave between the outer support rim and a region of co-aption of the valve leaflets. In one case the valve leaflets have a region of co-aption and the valve body is reinforced at the region of co-aption. The valve body may be thickened at the region of co-aption. The region of co-aption may extend for an axial length of at least 1 mm. The region of co-aption may extend for a depth of from 1 mm to 5mm. In one embodiment the support rim of the valve body is reinforced. The support rim of the valve may be thickened. In one embodiment the valve comprises three valve leaflets. In another embosiment the valve comprises six valve leaflets. In one embodiment the polymeric material is stable to gastric fluid for at least 3 months, for at least 4 months, for at least 5 months, for at least 6 months, for at least 7 months, for at least 8 months, for at least 9 months, for at least 10 months, for at least 1 1 months, or for at least one year. In one case the polymeric material takes up less than about 5%, less than about 10%, less than about 15%, less than about 20%, less than about 25%, or less than about 30% by weight of water at equilibrium. In one embodiment the polymeric material of the valve body has a density of from 0.1 g/cm3 to 1 .5 g/cm3, or 0.3 to 1 .2g/cm3, or 0.8 to 0.9g/cm3, or 0.5 to 0.6g/cm3. In one embodiment the distance between the proximal end of the support region of the valve body and the distal end of the valve leaflets is less than 50mm, or less than 40mm, or less than 30mm, or less than 25mm, or less than 20mm, or less than 15mm. In one case the polymeric material of the valve body is of an elastic material. The valve 1 comprises a polymeric valve body having an outer support region with a rim 2, at least three valve leaflets 3, 4, 5, and a main body region 6 extending between the support rim 2 and the valve leaflets 3, 4, 5. The valve leaflets 3, 4, 5 extend inwardly and terminate at end faces 7, 8, 9 respectively. The leaflets each 3, 4, 5 have legs a, b which extend at an included angle of 120° to each other. The adjacent pairs of legs 3a; 4a; 4b; 5b; 5a; 3b; co - apt to close the gap between the valve leaflets when the valve is in the normally closed configuration. The first configuration of the valve is a normally closed configuration in which the valve leaflets 3, 4, 5 co-apt to close the valve. The second configuration is an open configuration to allow fluid flow in which the valve leaflets 3, 4, 5 are opened such that the leaflet leg pairs 3a; 4a; 4b; 5b; 5a; 3b are opened and spaced-apart in response to a force Fl to allow flow through the valve. The valve can also be opened in response to an external force F2, for example as might be applied if a medical instrument such as a catheter is passed therethrough. The various configurations of the valve 1 are illustrated in Figs. 1 1 to 20. In the first or normally closed configuration (Figs 9, 15) the valve leaflets 3, 4, 5 co-apt. When a urological pressure force F l is applied to the valve body. This force initially pushes the valve leaflets 3, 4, 5 against one another and if the pressure is greater than a set value, the valve body will invert. The start of inversion is illustrated in Fig. 16. When the valve is fully opened in response to force Fl the valve main body (and the leaflets 3, 4, 5) extend downwardly as illustrated in Figs. 10 and 17. This allows flow to pass through the valve. When the flow is stopped the valve main body will return to the original configuration by everting in response to the biasing of the polymeric material to return to the normally closed configuration with the valve leaflets extending as illustrated in Figs. 1 1 and 15. When force F2 is applied to the valve leaflets 3, 4, 5 the leaflet legs pairs 3a; 4a; 4b; 5b; and 5a; 3b open to allow an object such as a medical instrument to pass (Figs. 13, 20). Fig. 19 illustrates a partially open configuration in response to a force F2. When the instrument is withdrawn the force F2 is removed and the leaflets 3, 4, 5 return to the closed position under the inherent biasing of the polymeric material of the valve body (Fig. 13). The valve leaflets 3, 4, 5 are reinforced in the region of co - aption. In this case, this is achieved by a local thickening of the polymeric material in this region. Similarly the support rim 2 is reinforced by a local thickening of the polymeric material. The region of co-aption of the valve leaflets 3, 4, 5 has an axial extent which is typically from 1 to 5mm. This ensures positive co-aption of the leaflets across a significant interfacial area when the valve is in the normally closed configuration. The thickness of the leaflets at the region of co- aption is typically between 0.1 mm and 10mm. By varying the properties (such as density) of the material of the valve the valve can be tailored to accommodate varying yield pressures. The valve accomplishes this by controllably inverting when placed under pressure. The valve 1 of the invention returns to its original working position after being fully opened. This is accomplished without damaging the working valve. The important characteristics influencing the functioning of the valve are the leaflet legs that impinge on one another. By varying the geometry and length of the leaflets 3, 4, 5 the valve 1 can be made to open in one direction at different pressures. Opening in the opposite direction is somewhat less dependant on the geometry of the leaflets and more dependant on the elasticity and density of the material the device is made from. Additionally, the overall diameter and the diameter to which the leaflets open influence the opening force in both directions. The valve may be of any suitable biocompatible polymeric material. It may be of a biocompatible polymeric material having properties which allow the valve to function as described. The materials used for the production of this valve have a % elongation between 50% and 3000%. The material also has a tensile strength of between 0.01 and 5 MPa. Addionally the material could have an antimicrobial action to prevent colonisation when in-vivo. Additionally the material can be elastic or viscoelastic and can optionally be an open cell foam. The density of the material should be between 0.1 g/cm3 to 1.5 g/cm3. The valve may have any desired number of leaflets, for example the valve 30 illustrated in Figs. 21 to 26 has six valve leaflets 251 . These leaflets 251 are oriented perpendicular to direction of flow to additionally allow greater distensibility of the valve aperture. The valve 30 is similar to the valve described above and comprises a polymeric valve body having a proximal outer support region with a rim 32, six valve leaflets 33, and a main body region 36 extending between the support rim 32 and the valve leaflets 33. The valve leaflets 33 extend terminate at distal end faces 33. The leaflets each have legs which extend at an included angle of 60° to each other. The adjacent pairs of legs co - apt to close the gap between the valve leaflets 33 when the valve is in the normally closed configuration. The first configuration of the valve 30 is a normally closed configuration in which the valve leaflets 33 co-apt to close the valve. The second configuration is an open configuration to allow fluid flow in which the valve leaflets 33 are opened such that the leaflet leg pairs are opened and spaced-apart in response to a force Fl to allow flow through the valve 30. The valve can also be opened in response to an external force F2, for example as might be applied if a medical instrument such as a catheter is passed therethrough. The various configurations of the valve 30 are illustrated in Figs. 21 to 26. In the first or normally closed configuration (Fig. 21 ) the valve leaflets 33 co-apt. When a urological pressure force Fl is applied to the valve body. This force initially pushes the valve leaflets 33 against one another (Fig. 22) and if the pressure is greater than a set value, the valve body will invert as illustrated in Fig. 23. When the valve is fully opened in response to force Fi the valve main body (and the leaflets 33) extend downwardly as illustrated in Fig. 23. This allows flow to pass through the valve. When the flow is stopped the valve main body will return to the original configuration by everting in response to the biasing of the polymeric material to return to the normally closed configuration with the valve leaflets extending as illustrated in Fig. 21. Fig. 26 illustrates a partially open configuration in response to a force F2. When the instrument is withdrawn the force F2 is removed and the leaflets 33 return to the closed position under the inherent biasing of the polymeric material of the valve body. The valve leaflets 33 are reinforced in the region of co - aption. In this case, this is achieved by a local thickening of the polymeric material in this region. Similarly the support rim 32 is reinforced by a local thickening of the polymeric material. The region of co-aption of the valve leaflets 33 has an axial extent which is typically from 1 to 5mm. This ensures positive co-aption of the leaflets across a significant interfacial area when the valve is in the normally closed configuration. The thickness of the leaflets at the region of co- aption is typically between 0.1 mm and 10mm. The valve 30 requires different forces to open in the different directions. By varying the properties (such as density) of the material of the valve the valve can be tailored to accommodate varying yield pressures. The valve 30 accomplishes this by control lably inverting when placed under pressure. The valve 30 of the invention returns to its original working position after being fully opened. This is accomplished without damaging the working valve. Referring to Figs. 27 to 58 of the drawings there are illustrated various urological valve devices according to the invention. The devices comprise a valve 600 which may be of the type described above. The valve has a normally closed configuration in which the valve is closed and an open configuration in which the valve is opened for flow through the valve. The valve is movable from the closed to the open configuration in response to applied urological pressure. In some cases the valve 600 everts on movement between the closed and open configuration in response to applied urological pressure. On reduction of urological pressure to a present pressure the valve 600 returns from the open to the closed configuration. The device may be adapted for use in the male or female anatomy. In some cases the valve is mounted to a support. The support may be adapted for mounting in the urinary tract in which case there may be an anchor for anchoring the valve in situ. The valve may be external of the body and may be mounted in a housing having an inlet and an outlet. The inlet may be adapted for mounting to a catheter such as a Foley catheter. The outlet may be adapted for mounting to a drainage means such as a bag or the like. The invention provides a urological valve device that may be used to treat patients with stress urinary incontinence, for example as a result of a radical prostatectomy. The valve will open based on the pressure applied by the patient through the muscles of the bladder. The continence mechanism of the device is a one-way valve that maintains a leak-free system until a pre-defined hydraulic pressure is applied. Once the 'break-pressure' has been reached the lumen of the catheter is open to drain freely. The lumen will remain open until fluid flow has stopped after which the valve will reset itself (this may takes approx 1 5 sec after cessation of micturition). The valve is designed to open when a preset pressure applied to it. The valve is capable of remaining closed at higher pressures if they are not sustained for a prolonged period of time. For example, the valve can be opened by applying a pressure of 750mmH2O for 5 sec but should remain closed during an pressure of 900 mmHaO over a short time. The valve in this way is insulated from coughing/straining related pressure spikes. Fig. 30 is an exploded view of valve housing and valve 600, illustrating how the extended collar 610 on the distal cap 602 locates into the lumen of the valve 600. Figs. 31 to 33 illustrates the functioning of the valve 600 under the influence of hydrostatic pressure. Referring to Fig. 31 as the urethral fluid pressure begins to rise the valve 600 starts to deform slightly. At a predetermined pressure the valve 600 will completely evert thus providing a conducting path for fluid to pass. (Fig. 32) After a predetermined period of time the everted valve 600 will reorient itself to its original position. (Fig. 33) This is graphically illustrated in Fig. 34. The urological devices of the invention have features which function using polymeric viscoelastic materials.The viscoelastic polymeric materials form valves, which are normally closed but which can evert on exposure to pressure. The mechanism by which the valves evert is associated with the ability of the material to deform under pressure. The deformation of viscoelastic meterials under pressure can also be influenced by the duration over which the pressure is applied. The material used for may be as described below. The material may also be as described in our US201 1 -01 52395 A the entire contents of which are herein incorporated by reference. Valves of the type illustrated in Figs. 28 / 29 above manufactured from this material were tested for opening pressure and flowrate. The following results were obtained. 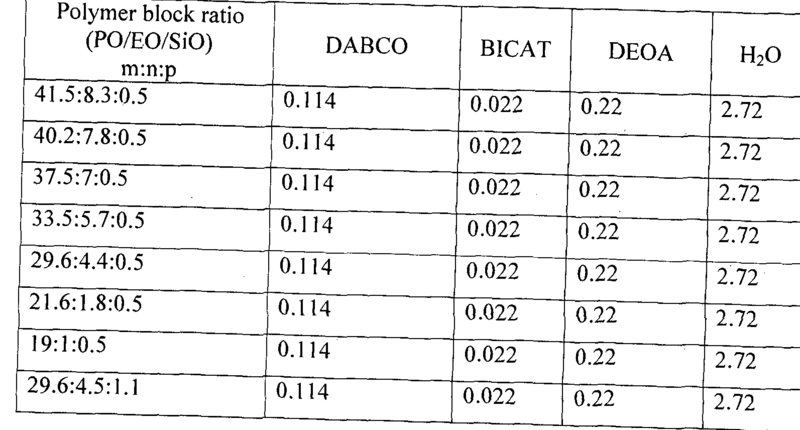 The results in the table above illustrate that a number of valves made with a density between 0.95 - 1 .07 g/ml have opening pressures within the required specification but with no leakage when the valve is closed. The flowrate through the valve is also noteworthy as this enables bladder emptying within a reasonable timeframe. The proliferation of Proteus Miribellis within urological devices results in the precipitation of salts and minerals from urine resulting in the ultimate encrustation of the device lumen leading to blockage. Although many attempts have been made to use antimicrobial coating to prevent this effect, no long term solution has been found and urinary catheters will become blocked within a 3-4 week period. The Foley urinary catheter has remained unchanged for the past 60 years. It is widely accepted that 100% of indwelling Foley catheters will become encrusted and block within a 4 week timeframe. A great deal of commercial effort has focused on increasing the longevity of these devices because long term users require specialist nurses to change the devices frequently, which is costly. There are very large number of disclosures in the prior art teaching the use of a variety of antimicrobial coatings and inserts for use in drainage catheters. US4603152 describes antimicrobial coatings for catheters canulea and the like. US7601361 describes durable antimicrobial coatings. US4932948 describes antimicrobial insert for a male urinary catheter. US5782808 describes an antimicrobial tubing connector. Much work has been carried out to coat indwelling. catheters with antimicrobial coatings in an effort to prevent biofilm formation. These coatings have either been ineffective or of insufficient durability to sustain the antimicrobial effect. Referring to Figs. 58 to 60 when the valve 551 is opened voluntarily a pressurised flow of urine through the catheter is generated until the level of urine in the bladder 501 drops below the level of the catheter inlet 503. Regular application of such pressurised flow generates sufficient force to prevent accumulation of bacterial biofilm at the catheter inlet and in the catheter lumen as illustrated in Figs. 59 and Fig. 60 respectively. In the invention a one way valve is incorporated into a catheter, especially a urinary catheter. The valve is designed not to leak but to open at a predefined yield pressure and return to its closed position following bladder emptying. The predefined yield pressure may correspond to an abdominal force generated by the patient through conscious straining or due to normal movement. The force of standing or sitting alone is known to generate significant abdominal pressures. The valve in this case is designed to be placed in line between the catheter and a urine collection bag. The valve facilitates the cyclic filling and emptying of the bladder and thus regular flushing of the catheter lumen. The emptying of the bladder may be conscious or unconscious due to movement. This invention teaches a completely different approach to that conventionally used to achieve an antimicrobial effect. In the invention a physical and mechanical means is used to achieve an antimicrobial effect, thus avoiding the need for potentially cytotoxic coatings. In addition this approach represents a durable and sustained effect rather than the transient effect seen with antimicrobial compounds. Accelerated microbial tests (Fig. 61 ) have demonstrated that incorporation of a tricuspid valve of a biocompatible foam material as described herein into a Foley catheter prolonges the 'time to encrustation' by a factor of almost 4 compared to an open Foley catheter. The valve of the invention also performs very significantly better than a catheter fitted with a ball valve which is manually movable between an open and close configuration. One search prio-art valve is available under the tradename FlipFlow. The invention provides a valve for control of urinary incontinance. The valve opens at a specific bladder pressure, in one case when the bladder is full (or at a required volume), without any manual manipulation. The bladder will then empty into an attached drainage bag and the valve will return to the closed position. This has the benefit of being easy to use. The use of a valve to offer intermittent rather than continual drainage has been shown to potentially reduce catheter blockage. Those users most likely to suffer from catheter blockages are those that have other comorbidities, a number of which result in dexterity or mobility. The valve aids patients who are unable to use a conventional catheter valve but who would still benefit greatly in maintaining 'normal' bladder function by intermittent drainage as opposed to continuous drainage. In vitro studies in a laboratory model of the catheterised bladder were undertaken to investigate the time to blockage of the valve of the invention in comparison to the 'Flip-flo' (Trade Mark of Bard Inc) valve and continuous drainage model. The bladder model is described by Striker et al in Stickler, D.J., Morris, N.S. and Winters, C. (1999). Simple physical model to study formation and physiology of biofilms on urethral catheters. Methods in Enzymology, 310:494. The valve of the invention demonstrated a significantly increased length of time to blockage versus a continuous drainage model (1 10.4 vs. 22.9 hours, p-value 0.001 ). There was no significant difference between a normally draining 'Flip-flo' valve and a 'Flip-flo' valve assisted by the automated syringe pump (40.0 vs. 45.1 hours, p-value- 0.425). The mean time to blockage was 1 10.4 hours for the valve of the invention compared to 45.1 hours for the automated Flip- flo: This result was highly significant (p- value 0.004). The bladder model consists of a glass chamber (the bladder) maintained at 37°C by a water jacket. Each model was sterilised by autoclaving and then a size 14ch Romed catheter, latex based was inserted into the bladder chamber through a section of silicon tubing (the urethra) at the base of the model. Catheters were secured in place at the outlet of the bladder by inflation of their balloons with 10 ml of deionised water. Where appropriate, the end of the catheters were then attached to either a valve of the invention, Flip-flo valve or left open for continuous drainage. The Flip-flo valve and the continuous drainage models were then subsequently connected to drainage bags in the normal way but the valve of the invention and automated Flip- flo valve were left to drain into a covered plastic beaker (to allow for an open system due to the pressures applied from the syringe pump). Sterile urine was pumped into the chambers so that residual volumes collected below the catheter eye-holes before flowing through the drainage tube to the collection bags/ beaker. The continence mechanism of the body lies within the urethra. The urethral closure mechanism consists of the external sphincter and the bladder neck (or internal sphincter). When contracted, these cause about a 40mm length of the urethra to be sealed. In a closed or obstructed urethra any increase in abdominal pressure, due to straining, acts on the outside of the bladder and on the bladder neck. In a normal continent patient, because these pressures are equal but acting oppositely no leakage occurs during the storage phase (when the bladder is filling). The voiding or micturition phase begins with relaxation of the internal forces that close the urethra, specifically external sphincter relaxation and opening of the bladder neck. This is followed by detrusor muscle contraction, which creates hydrodynamic pressure in the bladder leading to urine flow. Importantly, the hydrodynamic pressure in the bladder does not influence the opening of the bladder neck or the external sphincter [Paul Abrams, Urodynamics, Third Edition, Springer, page 13]. During micturition, when the urethra and bladder neck are fully open, the application of abdominal pressure only influences the bladder wall and not the urethra or bladder neck. It is widely acknowledged that the only effect of abdominal pressure application during unimpeded micturition is to increase hydrodynamic pressure within the bladder thus increasing flow rate [Paul Abrams, Urodynamics, Third Edition , Springer, pages 84-85]. If the urethra is partially obstructed, application of abdominal pressure will influence both the sealing of the bladder neck and pressurising of the outside of the bladder. The net effect in this case is to oppose the hydrodynamic pressure within the bladder and thus prevent flow. Many technologies have been developed to address intraurethral failure and in general they have been focused on improving the seal within the urethra. An example of this is the use of collagen injections into the bladder neck to bulk up the internal sphincter mechanism. US60631 19 and US5989288 describe augmenting the closure of the internal sphincter mechanism by positioning a prosthesis at the region of the upper urethra and bladder neck. These devices act to seal the urethra when the normal anatomical forces compress the outside of the bladder neck and urethra to prevent leakage. In contrast, in this invention a urological valve is located in the bladder and is not impacted by the pressures in the urethra. Indeed, the valve does not require any anatomical forces to maintain a seal, it opposes the pressure of the urine in the bladder. When abdominal resting pressure is acting on the outside of the bladder the valve provides an opposing pressure commensurate with the hydrodynamic pressure of the urine. When coughing occurs during the storage phase the opposing pressure exerted by the valve increases to match the rapid and short high-pressure pulses due to coughing. When the patient chooses to void, the application of a relatively low pressure for a prolonged duration causes the opposing force from the- valve to slowly diminish and ultimately disappear to generate hydrodynamic flow. In the invention a prosthesis is placed inside the bladder. The prosthesis has a valve, which is located at the end of a tubular conduit that holds it in position and traverses the bladder neck and external sphincter. The tubular conduit can be soft or resilient or can be soft with reinforced regions that are resistant to collapse. The conduit portion can allow urine to flow through its center. The tubular conduit can also have a contoured region or regions located along its external surface to help retain it in the urethra. These contoured regions could be in the form of a bulbous structure designed to be located at the membranous urethra in the male anatomy to prevent proximal migration. Alternatively the contours may be provided by a flared structure to conform to the female meatus to prevent proximal migration. The valve also has a circumferential flared region that is contoured to fit against the bladder wall. This region provides a means of sealing such that urine does not flow around the outside of the valve and is directed through the valve. In addition this flared region could be reinforced with nitinol wire or polymeric fibers to improve resistance to distal migration. Alternatively the flared region could be a balloon. In-situ, the prosthesis prevents urine flow when the valve is closed. The valve opens when the urine in the bladder exceeds a pre-defined hydrodynamic pressure for a prolonged period of time (a typical range is 690-900mmH2O for 10 sec). Due to the prolonged time requirement the valve will not open when exposed to pressures for shorter durations, even significantly higher pressures will not open the valve. For example a sneeze or cough could apply sufficient pressure around the outside of the bladder to generate a hydrodynamic pressure within the bladder of 1200-1600mmH2O but since this would only be sustained for 0.5- 1 second or even cycled repeatedly the valve will remain closed. The conduit, if soft, does not in any way augment the urethra. However, it may be desirable to make the conduit from a resilient material such that the urethra is kept open both at the internal and external sphincter. This would in turn mean that continence would be entirely dependent on the in-bladder valve. In the case where the conduit is resilient at the region of the internal and external sphincters, whereby the normal anatomical forces could not cause the urethra to be closed, a valve could be placed in the conduit that opens under similar hydrostatic pressures to the in-bladder valve. Referring to Figs. 68 to 70 there is illustrated another valve device 800 according to the invention. The device 800 comprises a hollow stem 801 and a head part 802 having slits 803 therein forming valve leaflets. When the slits 803 open in response to applied pressure, urine flows through the head part 802 and into a flow channel 804 extending through the stem 801. The stem 801 also has a bulbous part 805 to assist in locating and retaining the device in situ within a bladder neck 806. Figs. 71 to 73 illustrate the delivery and deployment of a valve device 810 having a head part 81 1 with a valve 812 and a stem part 813. The delivery system comprises a catheter 820 which is advanced into the neck of the bladder. The valve device 810 is retained within the catheter 820 in a retracted configuration (Fig. 71 ). The device 810 is deployed from the distal end 821 of the catheter (Fig. 72). During deployment the valve device 810 expands to a deployed configuration and the catheter 820 is withdrawn to deploy the proximal end of the device (Fig. 73). Figs. 74 and 75 illustrate the functioning of the valve device 810 deployed in the bladder neck. The valve 812 at the proximal end opens in response to applied pressure. Referring to Figs. 81 to 83 there is illustrated another valve device 860 according to the invention. The device 860 comprises a valve part 861 , a head part 862, and a stem part 863. The stem part 863 has a soft compressible foam structure 864 that anchors in the membranous urethra. Referring to Fig. 85 to 86 there is illustrated another urological device 900 according to the invention. In this case the device is for use in a male. The device 900 comprises a valve 901 at one end of a tubular stem 902. The device has a bladder retainer comprising a flared region 903 which is typically of 40mm diameter for a valve diameter of 9mm. The device also has a second retainer in this case provided by a bulbous region 904 for maintaining the position of the device in the urethra. The valve 901 is in this case of a polymeric viscoelastic foam material and is of the type described above with reference to Figs. 1 to 20. In this case the leaflets are at the top of the device and the valve has a stiffening means provided by vertical reinforcement features 905 which define a fulcrum or hinge region about which the valve leaflets are movable from a normally closed configuration as illustrated in Figs. 85 to 88 to an open position. The valve has a region of co-aption between the valve leaflets and has a normally closed configuration in which the valve leaflets are engaged at the region of co-aption and an open configuration in which the leaflets are separated at the co-aption region for fluid flow through the valve. The valve is movable automatically from the closed to the open configuration in response to applied urological pressure. In this case the leaflets evert on movement between the closed and the open configuration in response to user patient applied urological pressure. The valve is adapted to open in response to a preset pressure applied over a preset time. For example, the valve may be adapted to open in response to a pressure of at least 750mm H 0 applied for at least 5 seconds. However, the valve remains closed in response to a spike pressure applied for a short time such as would be generated by a user coughing. The valve remains open as fluid flows therethrough without a requirement for a user to continue to apply urological pressure. The flow through the valve is sufficient to keep the valve open. The valve returns to the closed configuration when flow through the valve has substantially stopped. The valve in this case everts on movement from the closed to the open configuration and reverts on movement from the open to the closed configuration. The various urological devices of the invention may comprise a suitable anti-microbial agent such as an anti-microbial coating. Referring to Fig. 89 there is illustrated another urological device 910 which is similar to the device of Figs. 85 to 88 and like parts are assigned the same reference numerals. In this case the retaining flare 903 is reinforced, for example by a mesh 91 1 which may, for example be of a shape memory material such as Nitinol. Referring to Figs. 90 to 93 there is illustrated another urological device 920 according to the invention which is similar to the device of Figs. 85 to 88 and like parts are assigned the same reference numerals. In this case he device is for female use and the retaining means comprises a meatal tab 921 for prevention of proximal migration. Referring to Fig. 95 the pressure profile of a urological device of the invention is illustrated during simulated bladder pressure ramp. It can be seen that until a certain pressure is excerted on the valve the valve does not open. Further the pressure continues to drop even after the initial depressurization of the valve due to opening. This in turn illustrates a similar point to Fig. 94 in that constant application of elevated pressure is not required to keep the valve open. Referring to Fig. 96 differential pressure control using a urological device of the invention is illustrated. In this illustration the first peak shows the normal opening of the valve due to application of elevated pressure. The magnitude of pressure required to trigger the valve in this case is indicative of a prolonged application or ramping of pressure or valsalva maneuver. The second set of peaks illustrates the application of high pressure spikes to the valve to simulate coughing. In the case of coughing the valve does not open. The following section describes one group of biomaterials that are suitable for manufacturing devices and valves of the invention. The material may also be as described in our US201 1 -0152395 A the entire contents of which are herein incorporated by reference. Use of polyethers as soft segments in polyurethane foams is know to result in soft elastic and viscoelastic materials due to the dynamic reinforcing effect of hydrogen bonding. Conversely, use of non-hydrogen bonding hydrophobic soft segments results in harder, less elastic material. Blending of such hydrophobic and hydrophilic homopolymer soft segments as shown in Figure 85 via urethane/urea linkages is known in the art to achieve mechanical properties appropriate to •specific applications. 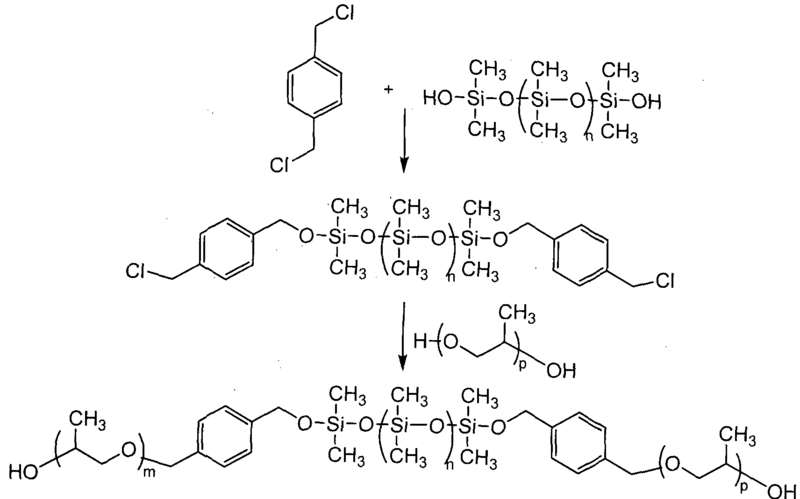 each of L1 and L2 is independently a bivalent Ci-2o hydrocarbon chain wherein 1 -4 methylene units of the hydrocarbon chain are optionally and independently replaced by -0-, -S-, -N(R)-, - C(O)-, -C(0)N(R)-, -N(R)C(0)-, -S02-, -S02N(R)-, -N(R)S02-, -OC(O)-, -C(0)0-, or a bivalent cycloalkylene, arylene, heterocyclene, or heteroarylene, provided that neither of L nor L comprises a urea or urethane moiety. Compounds of this invention include those described generally above, and are further illustrated by the classes, subclasses, and species disclosed herein. As used herein, the following definitions shall apply unless otherwise indicated. For purposes of this invention, the chemical elements are identified in accordance with the Periodic Table of the Elements, CAS version, Handbook of Chemistry and Physics, 75th Ed. Additionally, general principles of organic chemistry are described in "Organic Chemistry", Thomas Sorrell, University Science Books, Sausalito: 1999, and "March's Advanced Organic Chemistry", 5th Ed., Ed. : Smith, M.B. and March, J., John Wiley & Sons, New York: 2001 , the entire contents of which are hereby incorporated by reference. As described herein, compounds of the invention may optionally be substituted with one or more substituents, such as are illustrated generally above, or as exemplified by particular classes, subclasses, and species of the invention. It will be appreciated that the phrase "optionally substituted" is used interchangeably with the phrase "substituted or unsubstituted." In general, the term "substituted", whether preceded by the term "optionally" or not, refers to the replacement of hydrogen radicals in a given structure with the radical of a specified substituent. Unless otherwise indicated, an optionally substituted group may have a substituent at each substitutable position of the group, and when more than one position in any given structure may be substituted with more than one substituent selected from a specified group, the substituent may be either the same or different at every position. Combinations of substituents envisioned by this invention are preferably those that result in the formation of stable or chemically feasible compounds. The term "stable", as used herein, refers to compounds that are not substantially altered when subjected to conditions to allow for their production, detection, and preferably their recovery, purification, and use for one or more of the purposes disclosed herein. In some embodiments, a stable compound or chemically feasible compound is one that is not substantially altered when kept at a temperature of 40°C or less, in the absence of moisture or other chemically reactive conditions, for at least a week. The term "aliphatic" or "aliphatic group", as used herein, denotes a hydrocarbon moiety that may be straight-chain (i.e., unbranched), branched, or cyclic (including fused, bridging, and spiro- fused polycyclic) and may be completely saturated or may contain one or more units of unsaturation, but which is not aromatic. Unless otherwise specified, aliphatic groups contain 1- 20 carbon atoms. In some embodiments, aliphatic groups contain 1— 10 carbon atoms. In other embodiments, aliphatic groups contain 1-8 carbon atoms. In still other embodiments, aliphatic groups contain 1-6 carbon atoms, and in yet other embodiments aliphatic groups contain 1-4 carbon atoms. Suitable aliphatic groups include, but are not limited to, linear or branched, alkyl, alkenyl, and alkynyl groups, and hybrids thereof such as (cycloalkyl)alkyl, (cycloalkenyl)alky! or (cycloalkyl)alkenyl. The term "lower alkyl" refers to a CM straight or branched alkyl group. Exemplary lower alkyl groups are methyl, ethyl, propyl, isopropyl, butyl, isobutyl, and tert-butyl. The term "lower haloalkyl" refers to a C straight or branched alkyl group that is substituted with one or more halogen atoms. The term "heteroatom" means one or more of oxygen, sulfur, nitrogen, phosphorus, or silicon (including, any oxidized form of nitrogen, sulfur, phosphorus, or silicon; the quaternized form of any basic nitrogen or; a substitutable nitrogen of a heterocyclic ring, for example N (as in 3,4- dihydro-2H-pyrrolyl), ΝΗ (as in pyrrolidinyl) or NR+ (as in N-substituted pyrrolidinyl)). The term "unsaturated", as used herein, means that a moiety has one or more units of unsaturation. As used herein, the term "bivalent Ci-8 [or C|_6] saturated or unsaturated, straight or branched, hydrocarbon chain", refers to bivalent alkylene, alkenylene, and alkynylene chains that are straight or branched as defined herein. The term "alkylene" refers to a bivalent alkyl group. An "alkylene chain" is a polymethylene group, i.e., -(CH2)n- wherein n is a positive integer, preferably from 1 to 6, from 1 to 4, from 1 to 3, from 1 to 2, or from 2 to 3. A substituted alkylene chain is a polymethylene group in which one or more methylene hydrogen atoms are replaced with a substituent. Suitable substituents include those described below for a substituted aliphatic group. The term "alkenylene" refers to a bivalent alkenyl group. A substituted alkenylene chain is a polymethylene group containing at least one double bond in which one or more hydrogen atoms are replaced with a substituent. Suitable substituents include those described below for a substituted aliphatic group. The term "halogen" means F, CI, Br, or I. The term "aryl" used alone or as part of a larger moiety as in "aralkyl", "aralkoxy", or "aryloxyalkyl", refers to monocyclic or bicyclic ring systems having a total of five to fourteen ring members, wherein at least one ring in the system is aromatic and wherein each ring in the system contains 3 to 7 ring members. The term "aryl" may be used interchangeably with the term "aryl ring". As described herein, compounds of the invention may contain "optionally substituted" moieties. In general, the term "substituted", whether preceded by the term "optionally" or not, means that one or more hydrogens of the designated moiety are replaced with a suitable substituent. Unless otherwise indicated, an "optionally substituted" group may have a suitable substituent at each substitutable position of the group, and when more than one position in any given structure may be substituted with more than one substituent selected from a specified group, the substituent may be either the same or different at every position. Combinations of substituents envisioned by this invention are preferably those that result in the formation of stable or chemically feasible compounds. The term "stable", as used herein, refers to compounds that are not substantially altered when subjected to conditions to allow for their production, detection, and, in certain embodiments, their recovery, purification, and use for one or more of the purposes disclosed herein. 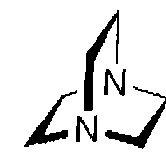 SiR°3; -(Ci-4 straight or branched alkylene)0-N(R°)2; or -(Ci-4 straight or branched alkylene)C(0)0-N(R°)2, wherein each R° may be substituted as defined below and is independently hydrogen, C,_6 aliphatic, -CH2Ph, -O(CH2)0_i Ph, or a 5-6-membered saturated, partially unsaturated, or aryl ring having 0-4 heteroatoms independently selected from nitrogen, oxygen, or sulfur, or, notwithstanding the definition above, two independent occurrences of R°, taken together with their intervening atom(s), form a 3-12-membered saturated, partially unsaturated, or aryl mono- or bicyclic ring having 0-4 heteroatoms independently selected from nitrogen, oxygen, or sulfur, which may be substituted as defined below. Suitable monovalent substituents on R° (or the ring formed by taking two independent occurrences of R° together with their intervening atoms), are independently halogen, -(CH2)o_ 2R*, -(haloR*), -(CH2)0_2OH, -(CH2)o-2ORe, -(CH2)o-2CH(OR,)2; -0(haloRe), -CN, -N3, -(CH2)0_ 2C(0)Re, -(CH2)o-2C(0)OH, -(CH2)o-2C(0)OR*, -(CH2)0.2SRe, -(CH2)0-2SH, -(CH2)0-2NH2, -(CH )o-2NHR*, -(CH2)o_2NR'2, -N02, -SiR'3, -OSiR*3, -C(0)SR* -(C straight or branched alkylene)C(0)OR*, or -SSR* wherein each R* is unsubstituted or where preceded by "halo" is substituted only with one or more halogens, and is independently selected from C] -4 aliphatic, - CH2Ph, -0(CH2)o_iPh, or a 5-6-membered saturated, partially unsaturated, or aryl ring having 0- 4 heteroatoms independently selected from nitrogen, oxygen, or sulfur. Suitable divalent substituents on a saturated carbon atom of R° include =0 and =S. Suitable divalent substituents on a saturated carbon atom of an "optionally substituted" group include the following: =0, =S, =NNR* 2, =NNHC(0)R*, =NNHC(0)OR*, =NNHS(0)2R*, =NR*, =NOR*, -0(C(R* 2))2-30- or -S(C(R* 2))2_3S- wherein each independent occurrence of R* is selected from hydrogen, C|_6 aliphatic which may be substituted as defined below, or an unsubstituted 5-6-membered saturated, partially unsaturated, or aryl ring having 0-4 heteroatoms independently selected from nitrogen, oxygen, or sulfur. Suitable divalent substituents that are bound to vicinal substitutable carbons of an "optionally substituted" group include: -0(CR* 2)2-30- wherein each independent occurrence of R* is selected from hydrogen, Ci_6 aliphatic which may be substituted as defined below, or an unsubstituted 5-6-membered saturated, partially unsaturated, or aryl ring having 0-4 heteroatoms independently selected from nitrogen, oxygen, or sulfur. Suitable substituents on the aliphatic group of R* include halogen, -R*, -(haloR*), -OH, -OR*, -O(haloR'), -CN, -C(0)OH, -C(0)OR*, -NH2, -NHR*, -NR*2, or -N02, wherein each R* is unsubstituted or where preceded by "halo" is substituted only with one or more halogens, and is independently Ci_ aliphatic, -CH2Ph, -0(CH2)o_i Ph, or a 5-6-membered saturated, partially unsaturated, or aryl ring having 0-4 heteroatoms independently selected from nitrogen, oxygen, or sulfur. Suitable substituents on a substitutable nitrogen of an "optionally substituted" group include -Rf, -NR† 2, -C(0)R†, -C(0)OR†, -C(0)C(0)R†, -C(0)CH2C(0)R†, -S(0)2R†, -S(0)2NR† 2, -C(S)NR† 2, -C(NH)NR† 2, or -N(R†)S(0)2R†; wherein each RT is independently hydrogen, Ci_6 aliphatic which may be substituted as defined below, unsubstituted -OPh, or an unsubstituted 5-6- membered saturated, partially unsaturated, or aryl ring having 0-4 heteroatoms independently selected from nitrogen, oxygen, or sulfur, or, notwithstanding the definition above, two independent occurrences of R†, taken together with their intervening atom(s) form an unsubstituted 3-12-membered saturated, partially unsaturated, or aryl mono- or bicyclic ring having 0-4 heteroatoms independently selected from nitrogen, oxygen, or sulfur. Suitable substituents on the aliphatic group of R† are independently halogen, -Re, -(haloR*), -OH, -OR*, -OfhaloR*), -CN, -C(0)OH, -C(0)OR', -NH2, -NHR', -NR*2, or -N02, wherein each Re is unsubstituted or where preceded by "halo" is substituted only with one or more halogens, and is independently C 1-4 aliphatic, -CH2Ph, -O(CH2)0-| Ph, or a 5-6-membered saturated, partially unsaturated, or aryl ring having 0-4 heteroatoms independently selected from nitrogen, oxygen, or sulfur. wherein the copolymers are chemically interspersed (bound) between urethane and/or urea linkages (i.e., at the bond designated with ? ) and wherein each of X, Y, m, n, p, L1, L2, R1, R2, R3, R4, R5, and R6 is as defined and described herein. Examples of polymer or co-polymer chains represented by X and/or Y include: poly(ethylene oxide), poly(difluoromethyl ethylene oxide), poly(trifluoromethyl ethylene oxide), poly(propylene oxide), poIy(difluoromethyl propylene oxide), poly(propylene oxide), poly(trifluoromethyl propylene oxide), poly(butylene oxide), poly(tetramethylene ether glycol), poly(tetrahydrofuran), poly(oxymethylene), poly(ether ketone), poly(etherether ketone) and copolymers thereof, poly(dimethylsiloxane), poly(diethylsiloxane) and higher alkyl siloxanes, poly(methyl phenyl siloxane), poly(diphenyl si!oxane), poly(methyl di-fluoroethyl siloxane), poly(methyl tri-fluoroethyl siloxane), poly(phenyl di-fluoroethyl siloxane), poly(phenyl tri- fluoroethyl siloxane) and copolymers thereof, poly(ethylene terephthalate) (PET), poly(ethylene terephthalate ionomer) (PETl), poly(ethy!ene naphthalate) (PEN), poly(methylene naphthalate) (PTN), poly(butylene teraphalate) (PBT), poly(butylene naphthalate) (PBN), polycarbonate. In certain embodiments, the present invention provides a pre-formed soft segment for polyurethane / urea foam. In some embodiments X is a polyether and Y is a polyether. More specifically in one case X and Y are both poly(propylene oxide). In certain embodiments, m and p are each independently between 2 and 50 and n is between 2 and 20. In some embodiments, m and p are each independently between 2 and 30 and n is between 2 and 20. As defined generally above, each of R1, R2, R3, R4, R5 and R6 is independently selected from one or more of R, OR, -C02R, a fluorinated hydrocarbon, a polyether, a polyester or a fluoropolymer. In some embodiments, one or more of R1, R2, R3, R4, R5 and R6 is -C02R. In some embodiments, one or more of R1, R2, R3, R4, R5 and R6 is -C02R wherein each R is independently an optionally substituted C .e aliphatic group. In certain embodiments, one or more of R1, R2, R3, R4, R5 and R6 is -C02R wherein each R is independently an unsubstituted C\. 6 alkyl group. Exemplary such groups include methanoic or ethanoic acid as well as methacrylic acid and other acrylic acids. In certain embodiments, one or more of R1, R2, R3, R4, R5 and R6 is independently R. In some embodiments, one or more of R1, R2, R3, R4, R5 and R6 is an optionally substituted Ci_6 aliphatic group. In certain embodiments, one or more of R1, R2, R3, R4, R5 and R6 is an optionally substituted Ci-6 alkyl. In other embodiments, one or more of R1, R2, R3, R4, R5 and R6 is an optionally substituted group selected from phenyl, 8- 10 membered bicyclic aryl, a 4-8 membered monocyclic saturated or partially unsaturated heterocyclic ring having 1 -2 heteroatoms independently selected from nitrogen, oxygen, or sulphur, or 5-6 membered monocyclic or 8-10 membered bicyclic heteroaryl group having 1 -4 heteroatoms independently selected from nitrogen, oxygen, or sulphur. Exemplary such R1, R2, R3, R4, R5 and R6 groups include methyl, ethyl, propyl, isopropyl, cyclopropyl, butyl, isobutyl, cyclobutyl, phenyl, pyridyl, morpholinyl, pyrrolidinyl, imidazolyl, and cyclohexyl. In certain embodiments, one or more of R1 , R2, R3, R4, R5 and R6 is independently -OR. I n some embodiments, one or more of R1, R2, R3, R4, R5 and R6 is -OR wherein R is an optionally substituted Q.6 aliphatic group. In certain embodiments, one or more of R1, R2, R3, R4, R5 and R6 is -OR wherein R is C].e alkyl. In other embodiments, one or more of R1, R2, R3, R4, R5 and R6 is-OR wherein R is an optionally substituted group selected from phenyl, 8-10 membered bicyclic aryl, a 4-8 membered monocyclic saturated or partially unsaturated heterocyclic ring having 1 -2 heteroatoms independently selected from nitrogen, oxygen, or sulphur, or 5-6 membered monocyclic or 8-10 membered bicyclic heteroaryl group having 1 -4 heteroatoms independently selected from nitrogen, oxygen, or sulphur. Exemplary such R1, R2, R3, R4, R5 and R6 groups include -Omethyl, -Oethyl, -Opropyl, -Oisopropyl, -Ocyclopropyl, -Obutyl, - Oisobutyl, -Ocyclobutyl, -Ophenyl, -Opy idyl, -Omorpholinyl, -Opyrrolidinyl, -Oimidazolyl, and -Ocyclohexyl. In certain embodiments, one or more of R1, R2, R3, R4, R5 and R6 is independently R wherein each R is a Q.6 aliphatic group substituted with one or more halogens. In some embodiments, each R is Ci_5 aliphatic substituted with one, two, or three halogens. In other embodiments, each R is a perfluorinated Ci-6 aliphatic group. Examples of fluorinated hydrocarbons represented by R1, R2, R3; R4, R5 and R6 include mono-, di-, tri, or perfluorinated methyl, ethyl, propyl, butyl, or phenyl. In some embodiments, each of R1, R2, R3, R4, R5 and R6 is trifluoromethyl, trifluoroethyl, or trifluoropropyl. In certain embodiments, one or more of R1, R2, R3, R4, R5 and R6 is independently a polyether. Examples of polyethers represented by R1, R2, R3, R4, R5 and R6 include poly(ethylene oxide), poly(difluoromethyl ethylene oxide), poIy(trifluoromethyl ethylene oxide), poly(propylene oxide), poly(difluoromethyl propylene oxide), poly(propylene oxide), poly(trifluoromethyl propylene oxide), poly(butylene oxide), poly(tetramethylene ether glycol), poly(tetrahydrofuran), poly(oxymethylene), poIy(ether ketone), poly(etherether ketone) and copolymers thereof. In certain embodiments, one or more of R1, R2, R3, R4, R5 and R6 is independently a polyester. Examples of polyesters represented by R1, R2, R3, R4, R5 and R6 include poly(ethylene terephthalate) (PET), poly(ethylene terephthalate ionomer) (PETI), poly(ethylene naphthalate) (PEN), poly(methylene naphthalate) (PTN), poly(butylene teraphalate) (PBT), poly(butyIene naphthalate) (PBN), polycarbonate. In certain embodiments, one or more of R1, R2, R3, R4, R5 and R6 is independently a fluoropolymer. Examples of fluoropolymers represented by R1, R2, R3, R4, R5 and R6 include poly(tetrafluoroethylene), poIy(methyl di-fluoroethyl siloxane), poly(methyl tri-fluoroethyl siloxane), poly(phenyl di-fluoroethyl siloxane). In some embodiments, R1, R2, R3, R4, R5 and R6 is independently hydrogen, hydroxy!, carboxylic acids such as methanoic or ethanoic acid as well as methacrylic acid and other acrylic acids. Alkyl or aryl hydrocarbons such as methyl, ethyl, propyl, butyl, phenyl and ethers thereof. Fluorinated hydrocarbons such as mono-, di-, tri, or perfluorinated methyl, ethyl, propyl, butyl, phenyl. Polyether such as Poly(ethy)ene oxide), poly(difluoromethyi ethylene oxide), poly(trifluoromethyl ethylene oxide), poly(propylene oxide), poly(difluoromethyl propylene oxide), poly(propylene oxide), poly(trifluoromethyl propylene oxide), poly(butylene oxide), poly(tetramethylene ether glycol), poly(tetrahydrofuran), poly(oxymethylene), poly(ether ketone), poly(etherether ketone) and copolymers thereof. Polyesters such as Poly(ethylene terephthalate) (PET), poly(ethylene terephthalate ionomer) (PETI), poly(ethylene naphthalate) (PEN), poly(methylene naphthalate) (PTN), Poly(Butylene Teraphalate) (PBT), poly(butylene naphthalate) (PBN), polycarbonate and .fluoropolymer such as Poly(tetrafluoroethylene), poly(methyl di-fluoroethyl siloxane), poly(methyl tri-fluoroethyl siloxane), po!y(phenyl di- fluoroethyl siloxane). As defined generally above, each of L1 and L2 is independently a bivalent Ci-2o hydrocarbon chain wherein 1 -4 methylene units of the hydrocarbon chain are optionally and independently replaced by -0-, -S-, -N(R)-, -C(O)-, -C(0)N(R)-, -N(R)C(0)-, -S02-, -S02N(R)-, -N(R)S02-, - OC(O)-, -C(0)0-, or a bivalent cycloalkylene, arylene, heterocyclene, or heteroarylene, provided that neither of L1 nor L2 comprises a urea or urethane moiety. In some embodiments, each of L and L is independently a bivalent Ci-2o alkylene chain. In certain embodiments, each of L1 and L2 is independently a bivalent C i _ 10 alkylene chain. In certain embodiments, each of L1 and L2 is independently a bivalent C|.6 alkylene chain. In certain embodiments, each of L1 and L is independently a bivalent C alkylene chain. Exemplary such L and L groups include methylene, ethylene, propylene, butylene or higher bivalent alkanes. In some embodiments, each of L1 and L2 is independently a bivalent Ci_2o alkylene chain wherein one methylene unit of the chain is replaced by -0-. In some embodiments, each of L1 and L2 is independently a bivalent CMO alkylene chain wherein one methylene unit of the chain is replaced by -0-. In some embodiments, each of L1 and L2 is independently a bivalent C|,6 alkylene chain wherein one methylene unit of the chain is replaced by -0-. In some embodiments, each of L1 and L2 is independently a bivalent C alkylene chain wherein one methylene unit of the chain is replaced by -0-. Exemplary such L1 and L2 groups include -OCH2-, -OCH2CH2-, -OCH2CH2CH2-, -OCH2CH2CH2CH2-, or higher bivalent alkylene ethers. In some embodiments, each of L1 and L2 is independently a bivalent C1.20 alkylene chain wherein at least one methylene unit of the chain is replaced by -O- and at least one methylene unit of the chain is replaced by a bivalent arylene. In some embodiments, each of L1 and L2 is independently a bivalent Ci-10 alkylene chain wherein at least one methylene unit of the chain is replaced by -O- and at least one methylene unit of the chain is replaced by a bivalent arylene. In some embodiments, each of L1 and L2 is independently a bivalent C|.6 alkylene chain wherein at least one methylene unit of the chain is replaced by -O- and at least one methylene unit of the chain is replaced by a bivalent arylene. In some embodiments, each of L1 and L2 is independently a bivalent C1-4 alkylene chain wherein at least one methylene unit of the chain is replaced by -O- and at least one methylene unit of the chain is replaced by a bivalent arylene. Exemplary such L1 and L2 groups include -OCH2-phenylene-, - OCH2CH2— phenylene-, -OCH2CH2-phenylene-CH2-, -OCH2CH2CH2CH2-phenylene-, and the like. each of L1 and L2 is independently a bivalent Ci-2o hydrocarbon chain wherein 1 -4 methylene units of the hydrocarbon chain are optionally and independently replaced by -0-, -S-, -N(R)-, - C(O)-, -C(0)N(R)-, -N(R)C(0)-, -S02-, -S02N(R)-, -N(R)S02-, -OC(O)-, -C(0)0-, or a bivalent cycloalkylene, arylene, heterocyclene, or heteroarylene, provided that neither of L1 nor L2 comprises a urea or urethane moiety. In some embodiments, each of X, Y, m, n, p, L , L , R , R , R , R , R , and R is as defined and described herein. As defined generally above, each of Rx and Ry is independently -OH, -NH2, a protected hydroxy! or a protected amine. In some embodiments, both of Rx and Ry are -OH. In other embodiments, both of Rx and Ry are -NH2. In some embodiments one of Rx and Ry is -OH and the other is -NH2. (methylthiomethoxymethyl)benzoate, 2,6-dichloro-4-methylphenoxyacetate, 2,6-dichloro-4~ ( 1 , 1 ,3,3-tetramethylbuty l)phenoxyacetate, 2,4-bis( 1 , 1 -dimethy lpropy l)phenoxyacetate, chlorodiphenylacetate, isobutyrate, monosuccinoate, (E)-2-methyI-2-butenoate, o- (methoxycarbonyl)benzoate, a-naphthoate, nitrate, alkyl Ν,Ν,Ν',Ν'- tetramethylphosphorodiamidate, alkyl N-phenylcarbamate, borate, dimethylphosphinothioyl, alkyl 2,4-dinitrophenylsulfenate, sulfate, methanesulfonate (mesylate), benzylsulfonate, and tosylate (Ts). For protecting 1 ,2- or 1 ,3-diols, the protecting groups include methylene acetal, ethylidene acetal, 1-t-butylethylidene ketal, 1 -phenylethylidene ketal, (4- methoxyphenyl)ethylidene acetal, 2,2,2-trichloroethylidene acetal, acetonide, cyclopentylidene ketal, cyclohexylidene ketal, cycloheptylidene ketal, benzylidene acetal, p-methoxybenzylidene acetal, 2,4-dimethoxybenzylidene ketal, 3,4-dimethoxybenzyIidene acetal, 2-nitrobenzylidene acetal, methoxymethylene acetal, ethoxymethylene acetal, dimethoxymethylene ortho ester, 1- methoxyethylidene ortho ester, 1-ethoxyethylidine ortho ester, 1 ,2-dimethoxyethylidene ortho ester, a-methoxybenzylidene ortho ester, l -(N,N-dimethylamino)ethylidene derivative, oc- (N,N'-dimethylamino)benzylidene derivative, 2-oxacyclopentylidene ortho ester, di-t- butylsilylene group (DTBS), l ,3-(l , l ,3,3-tetraisopropyldisiloxanylidene) derivative (TIPDS), tetra-t-butoxydisiloxane-l ,3-diylidene derivative (TBDS), cyclic carbonates, cyclic boronates, ethyl boronate, and phenyl boronate. wherein each of X, Y, m, n, p, L1 , I,2, R' , R2, R3, R4, R5, and R6 is as defined and described herein. 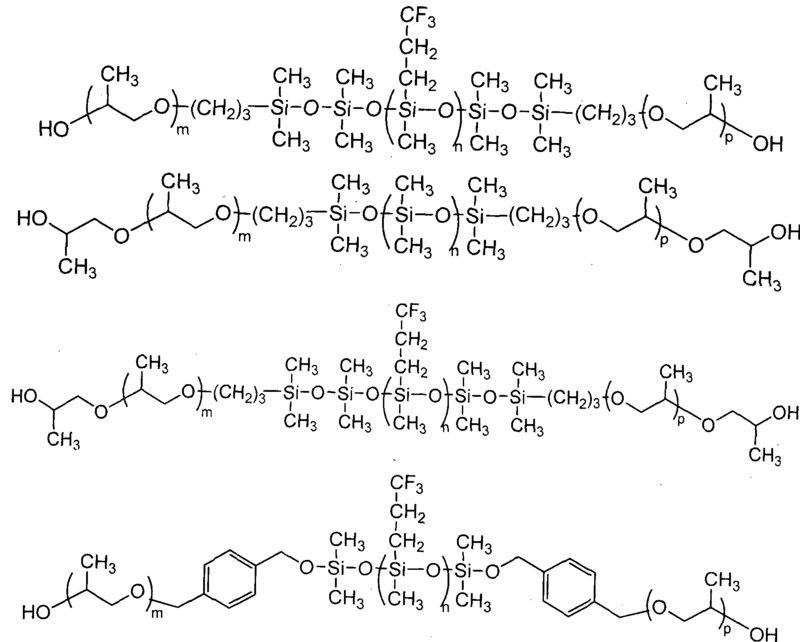 (b) wherein the copolymers are chemically interspersed (bound) between urethane and/or urea linkages (i.e., at the bond designated with ^). In certain embodiments, a provided biostable foam is stable to gastric fluid. In some embodiments, a provided biostable foam is stable to gastric fluid for at least one year. In some embodiments, a provided biostable foam is stable to gastric fluid for at least 3 months, for at least 4 months, for at least 5 months, for at least 6 months, for at least 7 months, for at least 8 months, for at least 9 months, for at least 10 months, for at least 1 1 months, or for at least one year. Methods for determining stability of a provided biostable foam are known in the art utilizing simulated gastric fluid and include those described in detail in the Exemplification, infra. In some embodiments, a provided viscoelastic foam, comprising a triblock copolymer of the present invention, is characterized in that the foam takes up less than about 30% by weight of water at equilibrium. In certain embodiments, a provided viscoelastic foam takes up less than about 5%, less than about 10%, less than about 15%, less than about 20%, less than about 25%, or less than about 30% by weight of water at equilibrium. One of ordinary skill in the art will appreciate that such chemical stability (i.e., in gastric fluid and therefore at very low pH) and hyrophobicity (i.e., water uptake of less than about 30% by weight) are characterisitics that differ dramatically from known siloxane polymers that are utilized in, e.g., the manufacture of contact lenses. For example, siloxane polymer that are utilized in, e.g., the manufacture of contact lenses require a water uptake of 50- 120%. As described above, the present invention provides a viscoelastic foam comprising a triblock copolymer of the present invention. It was suprisingly found that a provided foam has a high elongation capacity and the ability to recover very slowly following elongation. Indeed, it was found that a provided viscoelastic foam has an elongation capacity of about 200-1200%. In some embodiments, a provided viscoelastic foam has an elongation capacity of about 500%. In some embodiments, a provided viscoelastic foam has a Young's Modulus of about 0. 1 to about 0.6 MPa. In certain embodiments, a provided viscoelastic foam has a Young's Modulus of about 0.1 to about 0.5 MPa. One of ordinary skill in the art will appreciate that, depending upon the physical characteristics required for a particular use of a provided foam, a foam of varying densities can be prepared. For example, a valve having a thinner wall would require a foam having a higher density than a similar valve having a thicker wall in order to result in each valve having a similar physical characteristic (e.g., tensile strength, and the like). Thus, in certain embodiments, a provided viscoelastic foam has a density of 0.1 to 1 .5 g/cm3. In certain embodiments, a provided viscoelastic foam has a density of 0.3 to 1 .2 g/cm3. In certain embodiments, a provided viscoelastic foam has a density of 0.8 to 0.9 g/cm3. In some embodiments, a provided viscoelastic foam has a density of 0.5 to 0.6 g/cm3. 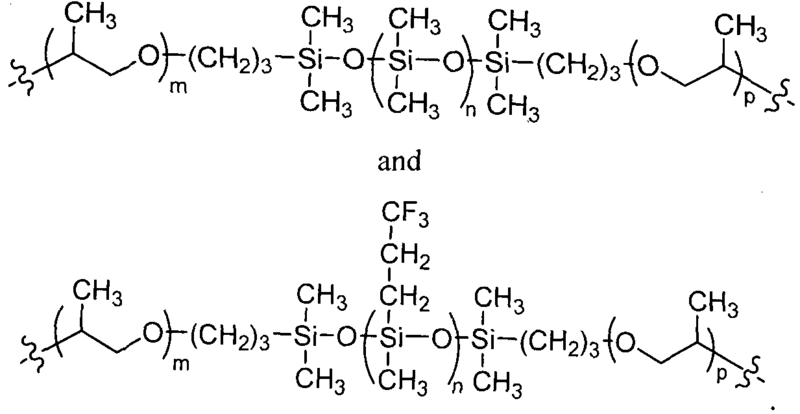 In certain embodiments, the present invention provides polyether-siloxane and polyether- fluorosiloxane polyurethane materials with a greatly reduced number of weak-links as illustrated by Figure 98 and Figure 99. This was achieved by preforming the soft segment prior to the polyurethane reaction. 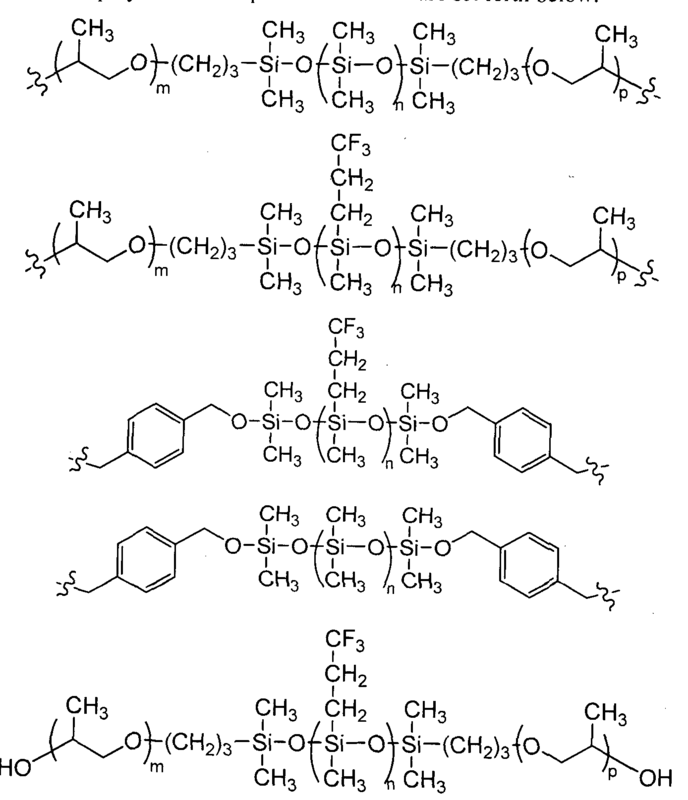 In the examples below a triblock copolymer based on polydimethyl siloxane and polypropylene oxide was used but it will be appreciated that other triblock copolymers such as those formed from polysiloxanes and poly(ethylene oxide), poly(difluoromethyl ethylene oxide), poly(trifluoromethyl ethylene oxide), poly(propy!ene oxide), poly(difluoromethyI propylene oxide), po!y(propylene oxide), poly(trifluoromethyl propylene oxide), poly(butylene oxide), poly(tetramethylene ether glycol), poly(tetrahydrofuran), poly(oxymethylene), poly(ether ketone), poly(etherether ketone) and copolymers thereof, poly(dimethylsiloxane), poly(diethylsiloxane) and higher alkyl siloxanes, poly(methyl phenyl siloxane), poly(diphenyl siloxane), poly(methyl di-fluoroethyl siloxane), poly(methyl tri- fluoroethyl siloxane), poly(phenyl di-fluoroethyl siloxane), poly(phenyl tri-fluoroethyl siloxane) and copolymers thereof, poly(ethylene terephthalate) (PET), poly(ethylene terephthalate ionomer) (PET1), poly(ethylene naphthalate) (PEN), poly(methylene naphthalate) (PTN), poly(butylene teraphalate) (PBT), poly(butylene naphthalate) (PBN) and polycarbonate could be used. Referring to Figure 98, copolymers of the form ABA, ABC and BAB were produced from homopolymers of polysiloxane and polypropylene oxide which were covalently linked using bonds less labile than urethane/urea. The molecular weight and chemical charateristics of such homopolymers were tailored to achieve a pre-soft-segment with the appropriate balance of hydrophilicity/hydrophobicity. Without wishing to be bound by any particular theory, it is believe that by using a non-urethane linked tri-block copolymer instead of the constiuent homopolymers as soft segments that the mechanical characteristics and hydrolytic stability of the resulting material is substantially improved. In some embodiments, the present invention provides a foam comprising a copolymer of the present invention. Such foams offer specific advantages over solid elastomers, especially for gastrointestinal device applications. These advantages include enhanced biostability in the gastric environment, compressibility, viscoelasticity and high 'surface area to volume ratio'. The foam formulations of the invention can mimic mechanical characteristics of the native gastrointestinal tissue. Diethanolamine (DEOA) is used as a branching agent although it is sometimes known as crosslinking agent. The molecular weight of DEOA is 105.14 g/mol. The effect of the DEOA to influence softness and elasticity of the end polymer. DABCO is a common blowing catalyst for reaction between NCO and H20. It has a molecular weight of 1 12.17 g/mol. This catalyst has the effect, in combination with H20, of manipulating the foam rise characteristics. To a 4 neck separable flask fitted with mechanical stirrer, was added 40 g of Silanol terminated poIy(trifluoropropyl methylsiloxane) (FMS-9922 from Gelest Inc.) and this was mixed with 50ml of toluene and fitted with a continuous flush of Nitrogen. To the reaction mixture 7.57 g of dimethyl chlorosilane (DMCS, from Sigma Aldrich) was added slowly over about 20 minutes keeping the temperature of the mixture constant at 30°C. With each addition of dimethyl chlorosilane, the mixture became hazy but cleared in a short period of time. Once the addition of dimethyl chlorosilane was complete, the mixture was heated to 90°C for 3 hours. The reaction was then washed with excess water several times to reduce the acidity of the mixture. The resulting mixture was dried over silica gel, filtered and vacuumed to remove solvent and traces of water at 65°C overnight. A clear fluid was then obtained with a very strong Si-H band in infra red spectroscopy (IR) at 2130 cm"' , which confirms the reaction. GPC analysis showed the molecular weight to be 1200g/mol. To 90 ml of reagent grade toluene in a 4 neck separable flask fitted with mechanical stirrer, 46.67g of Allyl terminated polypropylene glycol) (MW=700g/mol, Jiangsu GPRO Group Co.) was added and then heated to reflux. Then 40g of Hydride terminated FMS-9922 was dissolved in 50ml of reagent grade toluene and the temperature raised to around 90°C. To the reaction mixture 2 drops of hexachloroplatinic(IV) acid (0.01 M H2PtCl6 from Sigma) solution in isopropanol (by Merck) was then added. After this catalyst solution had been added, the mixture was refluxed for 1 hour and the solvent distilled off in order to get the final product. The reaction was followed by H-NMR and gel permeation chromatography (GPC) confirmed the final molecular weight to be 2700g/mol. Synthesis of aliphatic linked dimethylsiloxane based triblock copolymer pre-soft-segment: To 130ml of reagent grade toluene in a separable flask fitted with a mechanical stirrer, was added 64g of allyl terminated poly(propylene glycol) (MW=700g/mol, Jiangsu GPRO Co.) and both were mixed and heated to reflux. Then 40g of hydride terminated poly(dimethyl siloxane) (Silmer H Di 10 by Siltech Corp.) was dissolved in 50ml reagent grade toluene and the temperature raised to around 90°C. To this reaction mixture 2 drops of hexachloroplatinic(IV) acid (0.0 I M H2PtCl6 from Sigma) solution in isopropanol was added. After this catalyst solution was added, the mixture was refluxed for 1 hour and then the solvent was distilled off in order to get the final product. The reaction was followed with H-NMR and gel permeation chromatography (GPC) confirmed the final molecular weight of the roduct to be 2300g/mol. To a 100 ml separable flask fitted with a mechanical stirrer, 15g of hydroxy terminated polydimethyl siloxane (DMS-S 14 from Gelest Inc.) was added along with 5.36g of di-chloro p- xylene (from Sigma) and 0.0089g of Copper(II) acetylacetonate (Cu(Acac)2 from Sigma). The reaction mixture was refluxed at 1 10°C for 5 hrs. At this point, 19.77g of hydroxy terminated poly(propylene glycol) (from Sigma) was added dropwise and the reaction mixture was then refluxed for another 15hr. The progress of reaction was followed by Ή-NMR and the final molecular weight, determined by gel permeation chromatography (GPC), was 3000 g/mol. H-NMR analysis: Solvent used for Ή-N R analysis is CDC13. Aromatic H = 7.25-7.45 ppm, -CH2 = 4.5-4.6 ppm, -CH3 (of PPO)= 1 -1.4 ppm, -CH2 (of PPO)= 3.2-3.8 ppm,—OH (of PPO)= 3.8-4 ppm, -CH3(silanol)= 0.5-0.8 ppm. To a 100 ml separable flask fitted with a mechanical stirrer, 15g of hydroxy terminated polytrifluoromethyl siloxane (FMS-9922 , Gelest inc.) was added along with 5.9g of di-chloro p- xylene and 0.0098g of copper(Il) acetylacetonate (Cu(Acac)2 from Sigma). The reaction mixture was refluxed at 1 10 °C for 5 hrs. At this point, 21 .75g of hydroxy terminated poly(propylene glycol) (from Sigma) was added dropwise to the reaction mixture. The reaction was refluxed for another 15hr. The progress of reaction was followed by Ή-NMR analysis and the molecular weight, determined by gel permeation chromatography (GPC), was 3100 g/mol.
' H-NMR analysis: Solvent used for H-NMR analysis is CDC13. Aromatic Ή = 7.25-7.45 ppm, -CH2 = 4.5-4.6 ppm, -CH3 (of PPO)= 1 -1.4 ppm, -CH2 (of PPO)= 3.2-3.8 ppm,—OH (of PPO)= 3.8-4 ppm, -CH3(silanol)= 0.5-0.8 ppm. 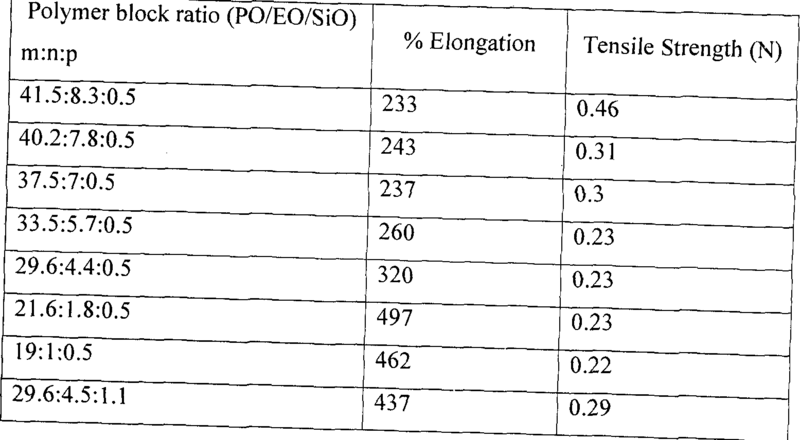 Polyurethane/urea polymer foams from Example 5 were compared to foams made from the stoiciometnc equivalent homopolymer soft segments. 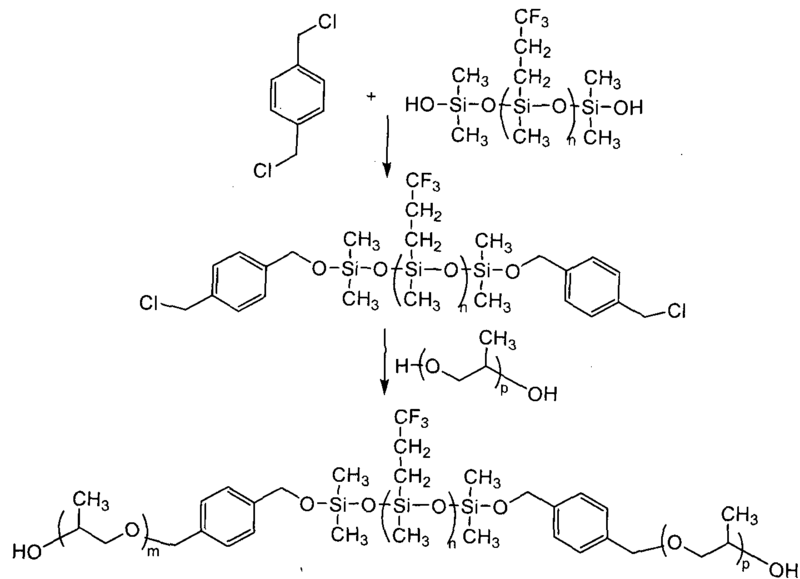 The foams with homopolymer based soft segments (VF130309 and VF 190309) shown in Figure 100 were produced as follows (VF 130309): Step 1 ) Firstly a mixture was made with 0.04 l g of DABCO LV-33 (Airproducts), 0.120g of bismuth neodecanoate (Bicat 8108M from Shepherd chemicals), 0.467g of diethanol amine (DEOA, from Sigma), 3.056g of poly(dimetyl siloxane) diol (DMS-sl 4 Gelest Inc.), 1 .633 g of polypropylene oxide (Mw = 700g/mol), 0.200g water and 0. 1 g of surfactant (Niax L-618 from Airproducts). These were added to a plastic flat bottomed container and were thoroughly mixed manually for 30 sec until a homogenous mixture was obtained. Step 2) To the above mixture, 15g of a diisocyanate prepolymer (PPT 95A Airproducts) was added. This was then thoroughly mixed by a mechanical stirrer for 5 seconds. The material was then molded and cured at 70°C for 2.5 hours and post cured at 50°C for another 3 hours. The foams in this example were made into dumbell shapes for tensile testing. Figures 100 and 101 illustrate the difference in mechanical behaviour between the comparitive materials indicating a favourable lowering in modulus for the triblock copolymer pre-soft-segments. Tensile test specimens were prepared in the same manner to the materials used in Example 4 and were subjected to accelerated aging in simulated gastric fluid (as per United States Pharmacopeia, "USP"). The materials produced with the pre-synthesised triblock copolymer soft segments resulted in substantially improved mechanical stability in gastric fluid as compared to the urethane/urea linked homopolymer equivalent as illustrated in Figure 90. This facilitates the use of such materials for prolonged periods in digestive and more specifically gastric environments. Table 6. Water blown formulations incorporating siloxane containing copolymer pre-soft- segments. The foam of the invention can be used for production of a valve of the type described in our US2007-0198048A, the entire contents of which are incorporated herein by reference. The valve has an open position and a closed position. The valve will have a proximal end and a distal end. The valve material can open from the proximal direction when the action of swallowing (liquid or solid) stretches an oriface by between 100% and 3000% in circumference. The open orifice optionally closes non-elastically over a prolonged period of time, thus mimicing the body's natural response. The duration taken to close may be between 2 and 15 sec. The material can stretch to between 100% - 300% from the distal direction when gas, liquid or solids exceeds a pre-determined force of between 25cmH20 and 60cmH2O. In some embodiments, the material absorbs less than 15% of its own mass of water at equilibrium. In some embodiments, the material loses (leaches) less than 3% of it's own mass at equilibrium in water or alcohol. In some embodiments, the material loses less than 10% of its tensile strength when immersed in a simulated gastric fluid at pH 1.2 for 30 days. In some embodiments, the valve material loses less than 25% of its % elongation when immersed in a simulated gastric fluid at pH 1.2 for 30 days. It has been reported that post fundoplication patients have yield pressures between 22 - 45 mmHg and that most of the patients with gastric yield pressure above 40 mmHg experienced problems belching. See Yield pressure, anatomy of the cardia and gastro-oesophageal reflux. Ismail, J. Bancewicz, J. Barow British Journal of Surgery. Vol: 82, 1995, pages: 943-947. Thus, in order to facilitate belching but prevent reflux, an absolute upper GYP value of 40 mmHg (550 Γηιτ)Η20) is reasonable. It was also reported that patients with visible esophagitis all have gastric yield pressure values under 1 5 mmHg, therefore, there is good reason to selectively target a minimum gastric yield pressure value that exceeds 15 mmHg. See Id. An appropriate minimum gastric yield pressure value would be 15mmHg + 25% margin of error thus resulting in a minimum effective valve yield pressure value of 18.75 mmHg or 255 mmH20. The test apparatus consists of a l m high vertical tube as shown in Figure 103, to which is connected a peristaltic pump and a fitting that is designed to house the valve to be tested. The valve to be tested is placed in a water bath at 37 °C for 30 minutes to allow its temperature to equilibrate. Once the temperature of the valve has equilibrated it is then installed into the housing such that the distal closed end of the valve faces the inside of the test apparatus. The pump is then switched on at a rate of 800 ml/min to begin filling the vertical tube. The rising column of water exerts a pressure that forces the valve shut initially. As the pressure in the column rises the valve reaches a point where it everts and allows the water to flow through. This point, known as the yield pressure, is then recorded and the test repeated four times. Considering that the lower oesophagus is exposed to the acidic pH exposure time for an average of 1 % of the measurement period, an accelerated aging methodology can easily be conceived. Constant exposure of a test material to the gastric contents (or USP Simulated Gastric Fluid - Reference USP Pharmacopeia) would represent an almost 10-fold increase in the rate of aging. Thus the time required to simulate one year of exposure of the lower oesophagus to the gastric contents is described by equation 1. Immersion of test specimens in USP Simulated gastric fluid for 40.27 days at 37 °C will approximate one year's exposure of the lower oesophagus to acidic gastric contents in a GERD patient's scenario. Results of accelerated stability of a valve prepared from a viscoelastic foam of the present invention are depicted in Figures 104 and 105. Various features of the invention are described in detail and illustrated herein. Appropriate features described with reference to one embodiment may be utilised in addition to and/or as a substitute for features described in other embodiments. The invention is not limited to the embodiments hereinbefore described which may be varied in detail. the valve having a normally closed configuration to prevent flow from the bladder and an open configuration for fluid flow through the valve, the valve being automatically movable from the closed configuration to the open configuration in response to a pre-set hydrodynamic pressure applied for a pre-set time. 2. A urological device as claimed in claim 1 wherein the valve support stem comprises a generally tubular support for extending at least partially through the urethra, the valve being located at one end of the support. 3. A urological device as claimed in claim 1 or 2 comprising a bladder retainer for locating the valve in the bladder. 4. A urological device as claimed in claim 3 wherein the bladder retainer comprises a flare extending radially outwardly of the support stem. 5. A urological device as claimed in claim 4 wherein the bladder retainer is of the same material as that of the support. 6. A urological device as claimed in claim 5 wherein the bladder retainer, the support and the valve are integrally moulded. 7. A urological device as claimed in any of claims 3 to 6 comprising stiffening means for the bladder retainer. 8. A urological device as claimed in claim 7 wherein the bladder retainer stiffening means is of a shape memory material such as Nitinol. 9. A urological device as claimed in any of claims 1 to 8 comprising a urethral retainer to prevent migration of the device. 10. A urological device as claimed in claim 9 wherein the urethral retainer comprises a meatal tab. 1 1. A urological device as claimed in claim 9 wherein the urethral retainer comprises a bulbous region of compressive material. 12. A urological device as claimed in any of claims 1 to 4 wherein the valve the valve is of a viscoelastic polymeric foam material. 13. A urological device as claimed in any of claims 1 to 12 wherein the valve comprises a plurality of valve leaflets, the valve having a region of co-aption between the valve leaflets, the valve leaflets being engaged at the region of co-aption in the normally closed configuration and the leaflets being separated at the co-aption region in the open configuration for fluid flow through the valve. 14. A urological device as claimed in claim 13 wherein the valve leaflets evert on movement between the closed and the open configuration in response to hydrodynamic pressure. 15. A urological device as claimed in any of claims 1 to 14 wherein the valve is adapted to open in response a hydrodynamic pressure of at least 750mm H20 applied for at least 5 seconds. 16. A urological device as claimed in any of claims 1 to 15 wherein the valve is adapted to remain closed in response to a spike pressure applied for a short time as would be generated by a user coughing. 17. A urological device as claimed in claim 16 wherein the spike pressure is 900mm H20 applied for a period of less than 0.5 seconds. 18. A urological device as claimed in any of claims 1 to 17 wherein the valve remains open as fluid flows therethrough without a requirement for a user to apply urological pressure. 19. A urological device as claimed in any of claims 1 to 18 wherein the valve returns to the closed configuration when flow through the valve has substantially stopped. 20. A urological device as claimed in any of claims 1 to 19 wherein the valve everts on movement from the closed to the open configuration. 21. A urological device as claimed in claim 20 wherein the valve reverts on return from the open to the closed configuration. 22. A urological device as claimed in any of claims 1 to 21 wherein the valve comprises at least three valve leaflets. 23. A urological device as claimed in any of claims 1 to 22 wherein the valve comprises a main body having a region which defines a hinge about which portion of the valve main body is movable between the closed and open configurations. 24. A urological device as claimed in claim 23 wherein the valve comprises stiffening means. 25. A urological device as claimed in claim 24 wherein the hinge region is at least partially defined adjacent to the stiffening means. 26. A urological device as claimed in claim 1 wherein the device comprises an antimicrobial coating. 27. A urological device substantially as hereinbefore described with reference to the accompanying drawings. NL8403174A (en) * 1984-10-17 1986-05-16 Franciscus Jacobus Maria De Vr Implantable closure device.